The United States Congress designated the Wrangell-Saint Elias Wilderness (map) in 1980 and it now has a total of 9,078,675 acres. All of this wilderness is located in Alaska and is managed by the National Park Service. 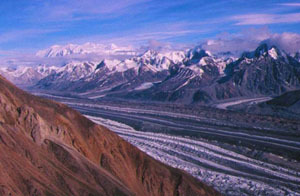 The Wrangell-Saint Elias Wilderness is bordered by the Russell Fjord Wilderness to the southeast. It is a land of remote valleys, wild rivers, and a fabulous wildlife population that includes the world's finest Dall sheep, grizzly bears, black bears, caribou, moose, bison, mountain goats, wolves, wolverines, beavers, coyotes, foxes, and marmots. In the north the glaciated peaks drop to tundra and boreal forested uplands. In the south massive glaciers spread from the mountains almost to the Gulf of Alaska. Several trails provide foot or horse access, but large braided rivers will often stop your progress. Mosquitoes are thick in the low country during the summer, and enough snow accumulates in the high country to make avalanches a year-round danger. The bold and the prepared, however, will discover Wilderness travel (by boot, ski, boat, or horse) at its grandest. On the Canadian side of the border lies Kluane National Park, and together these two areas house what may be this continent's most spectacular mountain kingdom. Vitus Bering saw a mountain rising far above anything else around and recorded the sighting on July 16, 1741, the first Russian written report of land in Alaska. Bering named Cape Saint Elias four days later, on Elias' saint day, and the name was later given as well to the 18,008-foot mountain (the second highest peak in the United States) that dominates what is now Wrangell-Saint Elias National Park and Preserve, the largest unit of the National Park System. Here you'll find 12,400,000 acres of national parkland, the most extensive glaciated country of Alaska (with more than 100 glaciers), a vastly rugged land that holds nine of North America's 16 highest peaks (many over 16,000 feet), the 90-mile-long and 4,000-foot-thick Bagley Ice Field (North America's largest subpolar ice field), and the unsurpassed Malaspina Glacier, which spreads 50 percent larger than the state of Delaware. Planning to Visit the Wrangell-Saint Elias Wilderness? How to follow the seven standard Leave No Trace principles differs in different parts of the country (desert vs. Rocky Mountains). Click on any of the principles listed below to learn more about how they apply in the Wrangell-Saint Elias Wilderness.